Contact the owner @ 228-369-9444. Refitting this classic cruising boat has been my weekend project for several summers now and she is finally in great condition, functionally and cosmetically. Outfitted with all the bells and whistles I ever wanted or could need, I intended to keep her until the final sunset. But now my physician says I need to stay out of the sun altogether. My loss could be your gain. 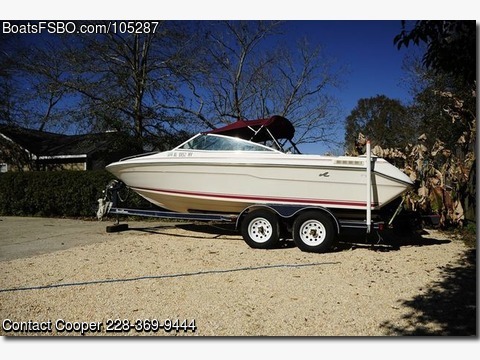 This is a legendary 21 ft. fiberglass Sea Ray Bow Rider powered by a 4.3-liter (175 HP) V-Six GMC Mercruiser engine (yep, Clem, the same one that is in your truck) with an Alpha One outdrive and stainless-steel prop. Regularly serviced, this thing could run forever. Engine in excellent condition with cylinder compression that meets new engine specifications at 185 psi or higher on all cylinders. Mercruiser Outdrive has just been (November 2018) professionally serviced and rebuilt from the bottom to the top – like new. Also replaced carburetor, alternator, starter, and hydraulic tilt and trim pump and solenoids and more within last 100 hours. New twin batter system topped off and conditioned between uses by permanently mounted onboard trickle charger..
Sea Ray provides the platform – heavy glass construction designed without wood in the primary hull substructure – avoiding the risk of rot that ruins so many other boats. Secondary below deck plywood supports originally provided the forms filled with closed cell foam floatation and served as attachment points for interior floor decking under carpet and other finishes – most of which has been replaced with rot-proof treated wood when the carpet and sheet vinyl finishes were renewed. I’m told that because of the foam insulation this boat won’t sink, even filled with water. Boat originated in Texas where it spent most of its life on fresh water lakes, owned by a doctor who sometimes had a little free time to take her out, but always maintained her in top-notch condition.